We tend to gravitate toward growing edibles in our yard. If we’re going to take the time and money to feed, water, protect, nurture and whisper sweet nothings to our trees and plants, then we’d like to get something in return. Vitamins and other nutrients are the goal from our edibles, but we’ll settle for flavor sometimes. Our ylang-ylang tree (Cananga odorata) doesn’t give us any edible delights, but this tree gets a free pass in our yard anytime. It provides us with the most extraordinary and divine flowers we’ve ever known. Just one cut flower in the center of our table makes the house smell better than any store-bought “smell-good” ever could. My husband couldn’t believe how great the house smelled when he came home the other day. It was aromatherapy at its finest. 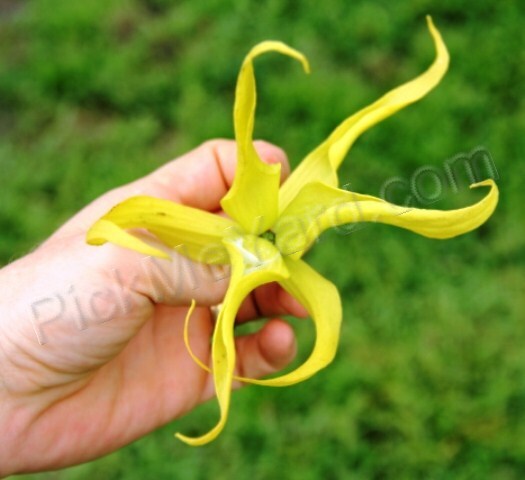 A highly aromatic ylang-ylang flower. I planted two small ylang-ylang trees in our yard about four years ago. I knew I was taking a risk by trying to grow them in our zone because they’re so sensitive to frost, but I had to try. 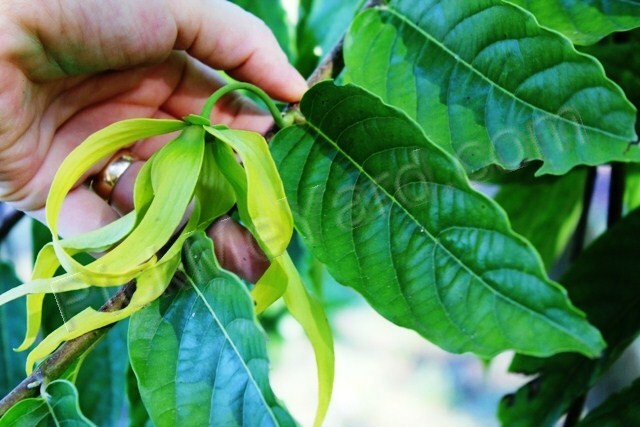 We’ve had some unusually cold winters in our zone 9b over the past few years and it kept damaging the young ylang-ylang trees. I didn’t cover them or help protect them from the cold in any way. The trees survived though and would recover from the cold and frost each year. By the time our Florida rainy season would start in the summer, the trees looked like they’d never seen a cold day. It seems like we waited forever for them to flower. We were wondering if they ever would. It was such a wonderful surprise this summer to find the trees full of flowers. To stand under the tree is intoxicating and heavenly. It was definitely worth the wait and our family is in complete agreement about that! 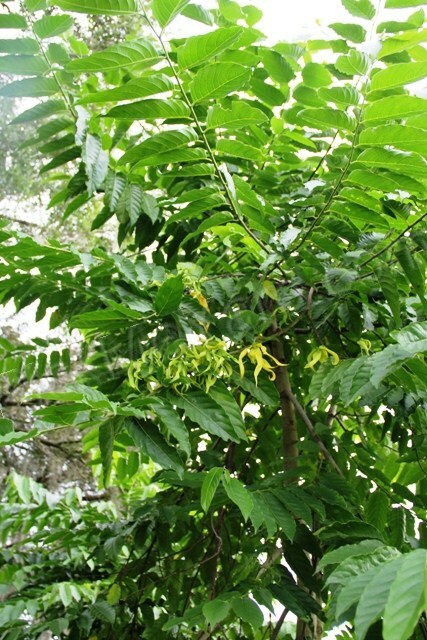 A medium sized ylang-ylang tree in our yard. A close-up of a ylang-ylang flower. A young ylang-ylang flower developing on the branch. 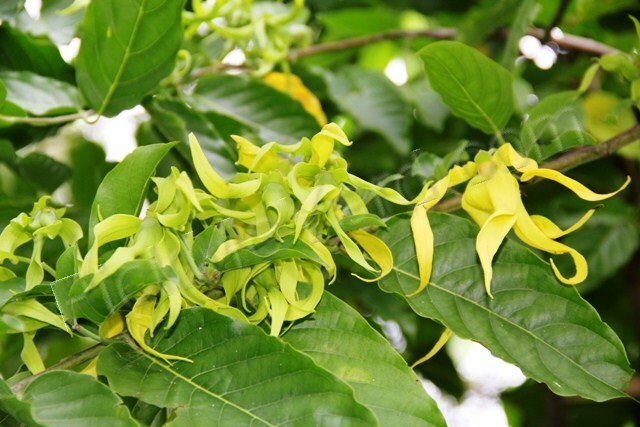 A cluster of ylang-ylang flowers. The flowers are hard to spot on the tree. 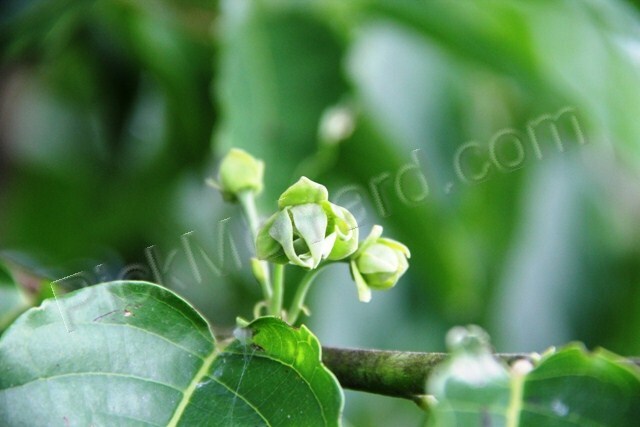 Ylang-ylang flowers in different stages of developement on the branch. 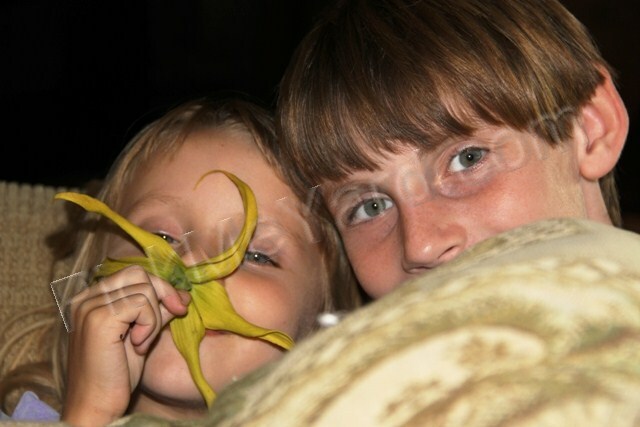 The kids enjoying the scent of a ylang-ylang flower. 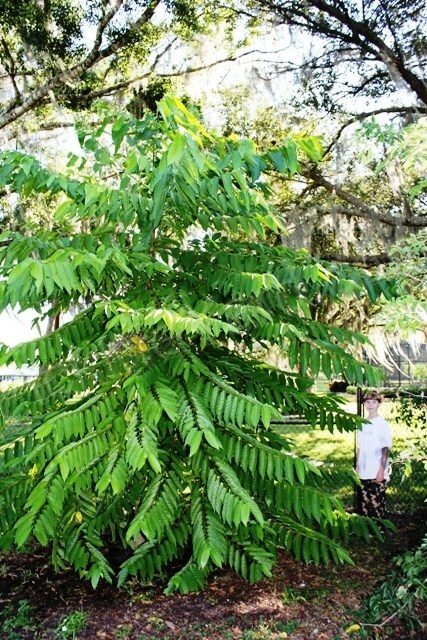 Click on TopTropicals.com for a more on this special tree… their site has a wealth of information. 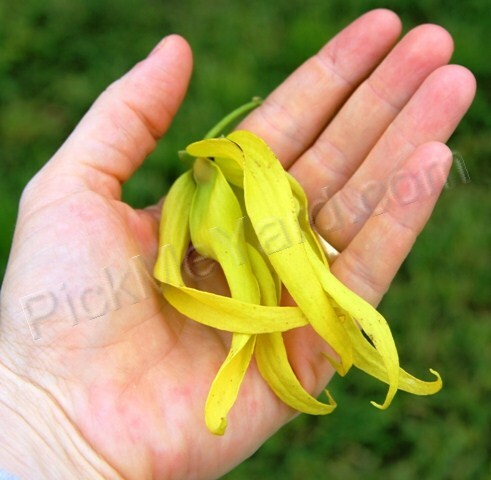 This entry was posted on August 15, 2011 at 11:08 pm and is filed under Flowers with tags growing ylang-ylang in southwest florida, photos of ylang-ylang flowers and tree, ylang-ylang flowers, ylang-ylang tree. You can follow any responses to this entry through the RSS 2.0 feed. You can leave a response, or trackback from your own site. Yes, you are right! Chanel No. 5 uses essential oils of sandalwood, vanilla, vetivert, ylang-ylang, rose, jasmine, neroli, bergamot, lemon, cedar and orris. I have a recipe and actually tried to make my own Chanel No.5 a few years ago. It was an interesting experiment. 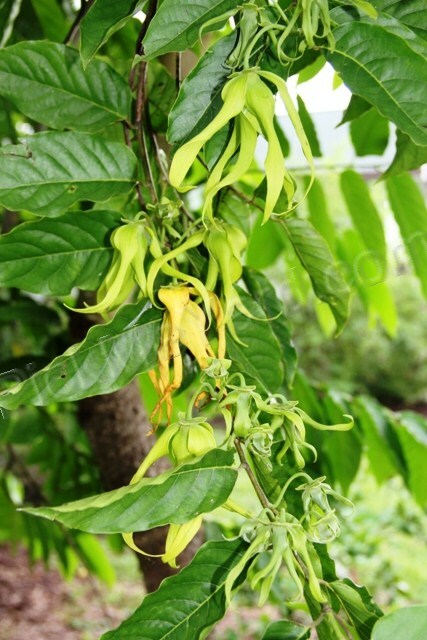 Essentail oil of ylang-ylang is very strong. It also gives me an instant headache if I don’t dilute it down to trace amounts in my carrier oil (usually jojoba). The fresh picked flowers don’t mess with my head at all. Apparently, the fragrance stimulates a part of the brain that releases endorphins and has a unique ability to relax face muscles.